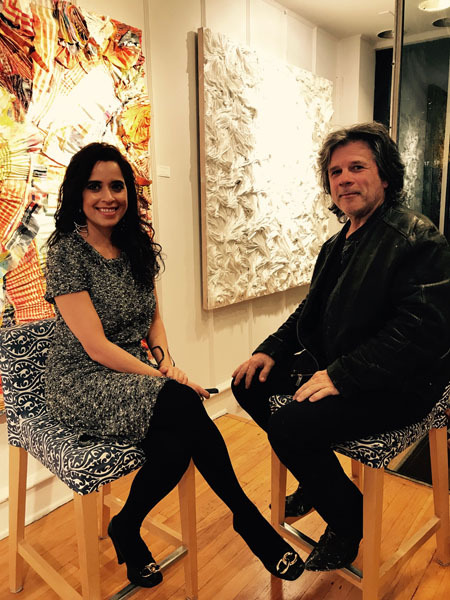 “Resident Magazine had the opportunity to sit down with internationally acclaimed artist Jeffrey Terreson at his gallery in Beacon, New York. 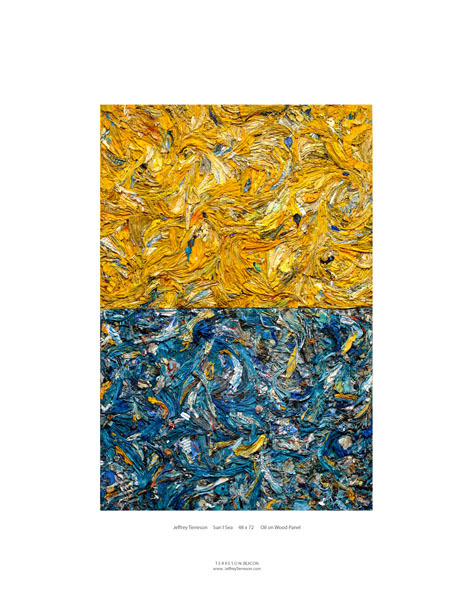 Terreson’s stunning artwork can be found around the world from leading corporate collections including NBC, Mobil Oil, and the United Nations to private collectors such as Ralph Lauren. EIMAN AZIZ: It’s such a pleasure to be with you here today. We should start with the most immediate and powerful observation of your work. Your beautiful art literally rises from the surface of the canvas. Tell us about that. 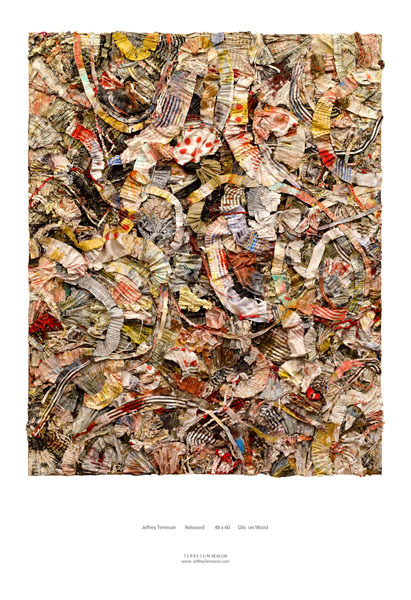 JEFFREY TERRESON: For me, there have always been other dimensions going on besides what you can put down on a brush. I use oils, for instance, in a way that allows me to come off the surface, to rise off the surface intentionally. This came about as I was working on the bodies of horses. I would start building up the textures on the backs of the horses, where the sunlight would hit. Then I did close-up of photography of this, the detail, the texture. And when you begin to explore this imagery, you realize… that’s it, that’s the painting! The horse is not the painting. The truth is, when I’m painting the horse, I’m not always assured of what I’m painting. Subjectively, it’s not a horse; it’s an abstract painting to me. 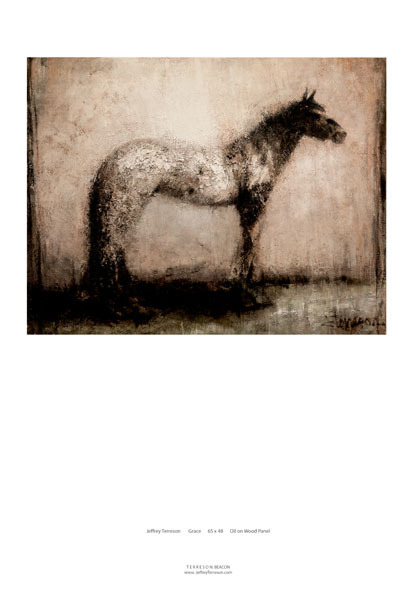 For example, When you paint past what we recognize as a horse it reveals the abstract and thus an abstract comes forth. I may be unaware I have painted anything else. It’s a journey that I started over 15 years ago. So now it feels like the accumulation of a known direction. I felt this approach building years ago. I didn’t know how I would get there. But I knew I had to explore. Well there are always two sides to this. There’s the practical side, like who influences you in your artwork, and there’s who you aspire to. In this sense, there are a few artists that always come to mind. 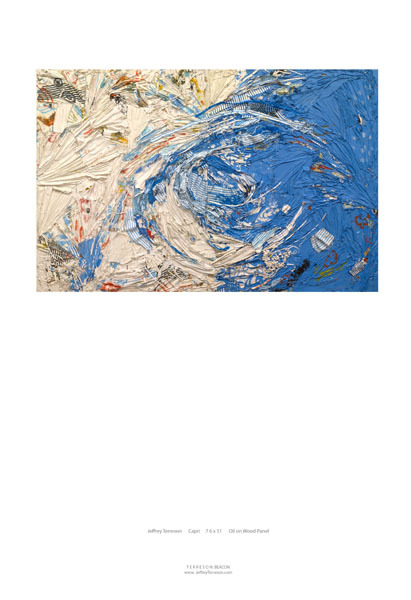 Most prominent are Cecily Brown and Eugène Leroy from France. He died in 2000. 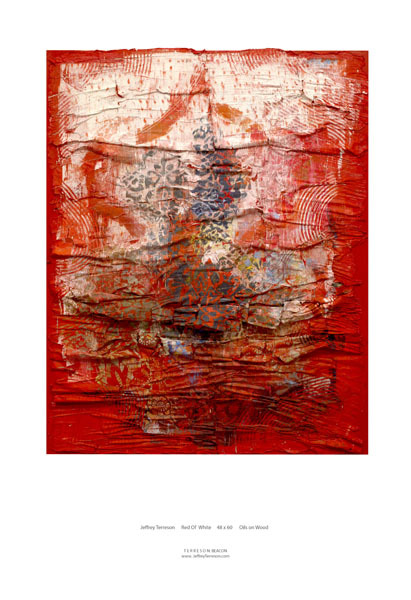 Leroy’s deeply textured paintings are just stunningly beautiful. I remember I went to one of his shows one time, and when I walked in I literally almost fell to my knees. There was something that resonated so strongly with what I was doing and what I wanted to do. 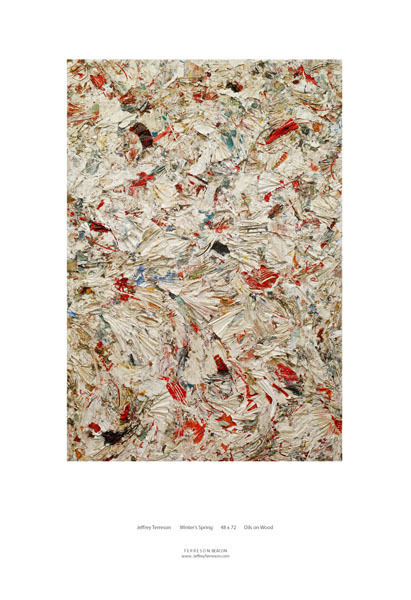 The same thing happened when I went to Cheim & Read and I saw Joan Mitchell’s work. It was the same impact. Both times, I had to sit down and recompose, catch my breath. It was the first time that I knew that I was going in the right vein. 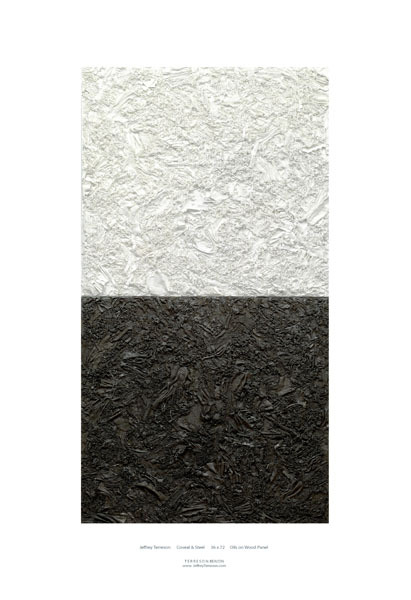 Even in your pure paint pieces, there’s a dimension that lifts the art from its background. What is it about the texture of your approach, that can’t be accomplished by the brush alone? When you’re painting with acrylics or oils – I use oils – you’re always going to have that signature brushstroke quality if you use a brush. What started to happen was I would be painting on the wall and whatever fell on the floor, I’d look down and say, “Oh, that’s nice, I have to save that.” So I started saving all my scrapings off the floor, literally scraping the paint off the floor to use. I’d clean my clean table off and save all the pieces of paint from there as well. Soon I was filling all kinds of aluminum tins and buckets. 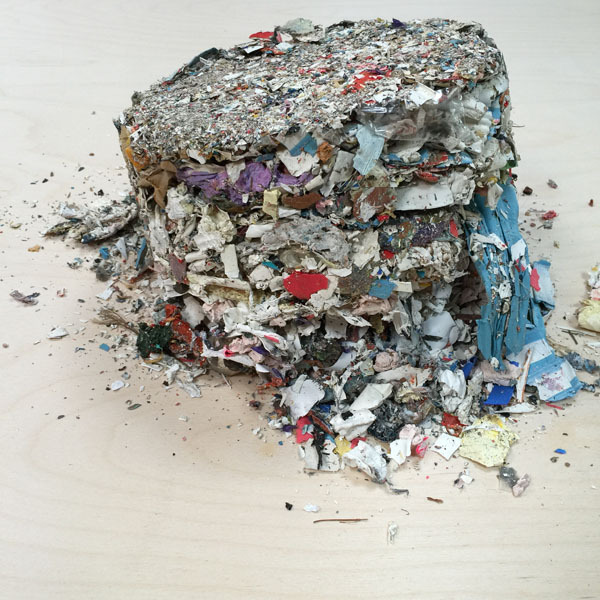 You can go into my studio now and see several containers of these saved scrapings. Really, the “paint” became anything. There are a number of movements, which believe that the paint is only an aspect of the creation. So, are you open to using any found objects in your approach? If I deemed it appropriate, yes. I don’t superfluously use things just to be different. I would use it if it had its purpose. If I felt there was a reason, a good reason. Your personal life represents interesting dimension, as well. Many artists follow a similar arc of living in and exhibiting in New York City or they remain focused on one style of art. Bedford and Beacon, the change and evolution of your approach, all represent texture that is different, intriguing, passionate. Tell us about that. First of all, there’s a part of “build it and they will come” that I personally find exciting. It takes courage to not rely on what’s safe, what has ‘worked’ in the past or what has traditionally worked for others. When people like the music that they’ve heard from you for a long time, they tend to want to hear the same song over and over. That can be confining. I don’t want to emulate anything that’s been done as my voice. It takes a while for people to understand and process a new approach. But that’s energizing. Sometimes it even involves connecting with a new audience. I have collectors all across the country. The new work has reached a new community of collectors. It has also resulted in some exciting museum credentials. You started painting at a very young age. Do you remember what drove you as a child to take on such a bold ambition? I always revert back to an experience, a moment that for me signaled the start of something. My father brought home one of those pressed tin watercolor sets with the plastic brush or I guess it was a wooden brush back then. He brought in these paints and a glass of water. I was four years old. And I bravely decided to create a self-portrait, which is already a pretty abstract concept in many ways for a four-year-old! But I remember, it was at that moment that I felt something open up. I felt the power of what is possible. Then in kindergarten the teacher wrote, unbeknownst to me, I was shown to it later on and I remember the words: “Jeffrey’s aptitude in art is exceptional, and he should consider doing that.” Wow, who says that about a five-year-old? To me, it was just an affirmation that whatever I was thinking and feeling and doing was already being confirmed by someone who had witnessed a lot of children in her life. I was always in the classroom, or in the art room, all the way through high school. I had a really great art teacher who let me explore what I wanted to do. What’s science? There’s something else besides art? [laughter] Actually my father really inspired me. He was one of the head electrical engineers at the World Trade Center. He worked tirelessly in that building. I remember him coming home late, leaving early in the morning to drive down to Lower Manhattan. He would bring home the blueprints, lay them out on the kitchen table and organize all the wiring. How much this, how much that. He would get all his people lined up for the next day. It was quite a wonderful period of time. He really taught me about work ethic. You’ve also told me you have a bit of a rebel or ‘outlaw’ streak in you? As far as the art goes, I’ve left galleries when I haven’t been totally satisfied. Many galleries have such a commercial drive that they will only want you to keep doing what sells. So the advantage of being an outlaw in spirit is that it has allowed me to do what I want or need to do. And from this will come the next opportunity or the right gallery. There are a few. There’s a fine line between doing what sells and staying true with your voice. I do know that if I had stayed with many of those galleries, I would not be where I am today. The “outlaw-esque” quality allowed me to pack up my bags when I needed to. So there’s not much I fear today. I certainly don’t fear my approach or my art. You have a wonderful studio and gallery space here in this historic Hudson Valley town. It’s somewhat unusual for artists to combine a work and sales space. Do you have any memorable experiences from patrons coming in? I’ve had several, and they’ve all been highly emotional. I’m out there completely alone without a safety net. I mean, there’s nothing underneath me. I have to sell. And I have to do art that resonates with people enough for them to buy. But when someone comes in and you get to see them moved by the art it’s powerful. In one case a 78-year-old man from Spain came in. He’s a painter, and he said to me, “I have never seen such beautiful work in my life.” He was crying. Amazing feeling. It held me for days. Another time, similar experience. One of the top art therapists in China came in. Same thing. He was moved to tears over some of the work. 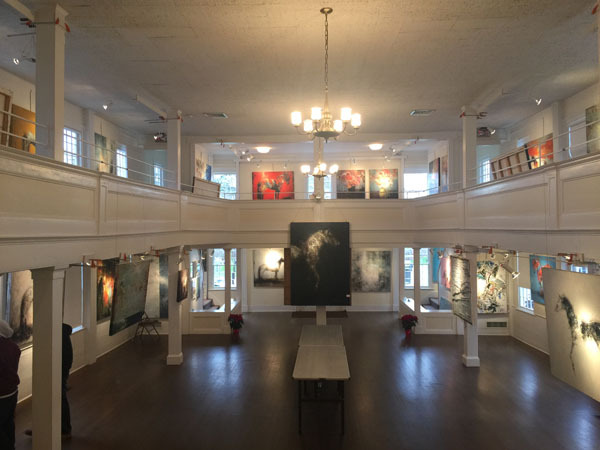 With an upcoming show in Bedford, New York at the Bedford Historical Hall starting December 1st thru the 3rd, this will be your 5th Biennial Fine Art Exhibition – “POWER in GRACE”. Correct, it’s always a great experience. The people in Bedford have been incredibly supportive and they look forward to it. I love my hometown area. So this exhibiton, has deep roots and memories for you? It must take enormous energy and commitment to create at such a strong pace. You know what the great thing about commitment, and having the constitution to execute that commitment, is – I never have to be told to get up and go to work. With the work I do is, there’s an authenticity to it. You know when you go through periods and you get branded, and you still stay with what you love doing, what comes out of it because you committed to it, it sets you free. I never dread going to work. Today, I was dancing in the back while painting. Oh, I was dancing to my artwork. Yes. [laughs] Well, my dances can always be seen at the gallery. [laughs] They’re on the wall. All my paintings have their own song. Chagall said that some of the most beautiful relationships throughout his life were with his paintings. Do you have a relationship with each painting? Very much so. That’s why some paintings can take a couple years, and some may take a week. I’ve said many times, that this, art, has been my longest relationship. Love and hate. But in the last 20 years, just madly in love with each other. When I walk up to a painting now, other than an initial idea, I don’t worry about anything anymore. I just go and paint. That aspect of being, that feeling is extremely organic and authentic. It’s vulnerable. Fearless. But it’s authentic.